Looking for the perfect gift for your favorite plant lover? If they don’t already have these awesome books from the American Hemerocallis Society, they are sure to appreciate some drool-worthy daylily material this year! Jam-packed with vibrant, full color photos and plenty of daylily descriptions, these glossy paperbacks make gift-giving a cinch! Presented in a full-color 8½” x 11″ format to enhance the quality of the photography, the text and layout of The Open Form Daylily: Spiders, Unusual Forms, and Other “Exotics” are by its author Oliver Billingslea. This publication is first and foremost a botanical book, treating two recognized classes of daylilies, “spiders” and “unusual forms,” while the final chapter offers a brief look at those open form daylilies which hybridizers sometimes call “flamboyants” or “exotics.” It is a book designed for the pleasure of the ordinary reader, as well as the aficionado who seeks more information on the detailed history of these increasingly popular forms. 232 pages, 616 full color illustrations, 10 sketches; softbound, first edition (2017). The definitive guide to double daylilies. This is the first American Hemerocallis Society publication devoted solely to the double daylily form. 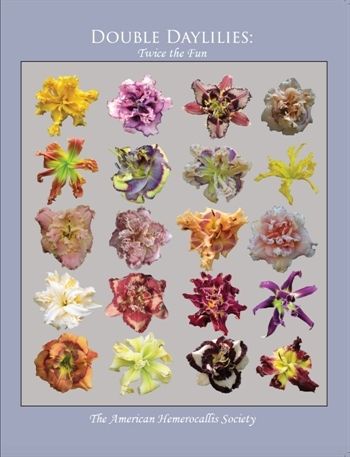 The book begins with The History of Double Flowers in the American Hemerocallis Society, written by David Kirchhoff. This chapter follows the development of the double daylily form beginning with H. ‘Kwanso’ and ending around the year 2000. Chapter Two is an illustrated guide to the double form complete with methods to distinguish it from the other forms, especially forms often mistakenly confused as doubles, such as polymerous and cristate. Chapter Three is a scientific discussion on what make a double ‘double’ and why it can occasionally be difficult to obtain consistent doubling. Chapter Four, The Hybridizers: Part 1 highlights the 12 most prominent current hybridizers of double daylilies, with extensive profiles of each. Chapter Five continues the profiles in The Hybridizers: Part 2, by Bruce Kovach, highlighting another 21 hybridizers. This is followed by Chapter Six, Awards and Honors; a compilation of the individual cultivar awards received by double daylilies in the American Hemerocallis Society. Pictures of all the most recent winning cultivars are included. The book concludes with perhaps the most exciting chapter, The Future: Seedlings and Future Introductions. In this chapter, a panel of 15 double hybridizers chose 73 seedlings, out of the many hundreds submitted, as best representing the cutting edge and future of doubles for the next few years. 110 pages, 341 full color illustrations, softbound; first edition January 2016. Do you have a friend or relative who gardens? Maybe they enjoy a mix of annuals and perennials, perhaps even have a familiar yellow or orange daylily or two in their landscape? The gift of an AHS membership would be perfect for them! What better way to ignite their interest in America’s favorite perennial than by introducing them to the mouth-watering varieties of Hemerocallis available today? AHS membership is the gift that keeps on giving! For the bargain price of $25, four different installations of the gorgeous Daylily Journal will arrive in your recipient’s mailbox over the course of the year, keeping that passion for plants flourishing even during the dark, cold winter. Are you an AHS member? If not, treat yourself, or direct your loved ones to the AHS website so they can give you the priceless gift of membership! You’ll be so glad you did!